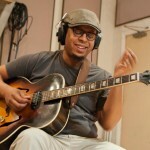 JEFF PARKER (b. Bridgeport, Connecticut USA, 4/4/67) is a guitarist, composer, educator, and sculptor of sonic textures. Since 1990, he has focused on being adaptable in musical environments that are constantly changing; he is an improvising musician. 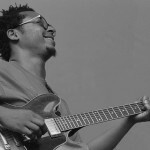 Recognized as one of contemporary music’s most versatile and innovative electric guitarists, his music is characterized by ideas of angularity and logic. He works in a variety of mediums, from Jazz to contemporary music, using ideas informed by innovations and trends in both popular and experimental music. He creates works that explore and exploit the contrary relationships between tradition and technology, improvisation and composition, and the familiar and the abstract. His sonic palette may employ techniques from sample-based technologies, analog and digital synthesis, and conventional and extended techniques from over 35 years of playing the guitar.